Powers: Armed Response agents were exoskeletons granting them superhuman strength (enhanced human to perhaps as much as Class 10) and durability. They can fly and fire energy blasts. They contained a number of weapons specifically designed to neutralize Wonder Man's ionic energy. They sometimes used hand-held guns and energy blasters. (Wonder Man II#1 - BTS / #17 (fb) - BTS) - Lotus had part in sending Goliath (Josten) on a rampage as part of her preparation of the population for the need for Armed Response. (Wonder Man II#3 - BTS / #17 (fb) - BTS ) - Lotus had part in sending Gamma-Burn on a rampage as part of her preparation of the population for the need for Armed Response. (Wonder Man II#6 - BTS) - Lotus bailed Rampage out of prison. (Wonder Man II#10 (fb) - BTS) - Stuart Clarke, creator of Rampage and the Recession Raiders, adapted his technology to design the Armed Response exoskeletons. (Wonder Man II#10) - Lotus ordered the activation of Armed Response. To make it appear that Armed Response was necessary, she first sent her agents to use rocket launchers to attack Beverly Hills. (Wonder Man II#11 - BTS) - Lotus was annoyed by the battle between Wonder Man and Angkor, wishing all apocalyptic paranoia to be focused on her supposed gang attacks in Beverly Hills. She hoped that Angkor might slay Wonder Man, ridding her of her rival, and she would then send in Armed Response against him. (Wonder Man II#13 - BTS) - Lotus agents continued their Beverly Hills assaults. (Wonder Man II#16) - Lotus' agents assaulted Beverly Hills while she romanced movie producer Sol Sterling in exchange for his financial backing of Armed Response. Armed Response prepared to fly in to put an end to the attacks, but Wonder Man arrived first, beating the attackers savagely. 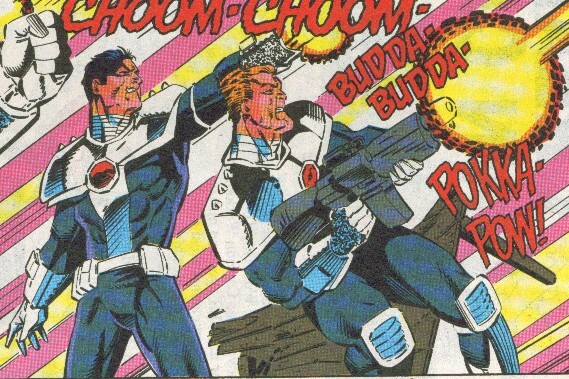 (Wonder Man II#17) - Armed Response stopped a series of Lotus' agents assaults on Beverly Hills. Lotus advertised Armed Response's services for a price to prevent attacks similar to what had been going on Beverly Hills. Wonder Man and the Avengers West Coast got involved with stopping the assaults on Beverly Hills. Armed Response slew several of Lotus' agents to prevent their revealing her involvement in the other attacks. This was witnessed by Jamie Flores, a.k.a. Dreamer, of Crazy Eight. (Wonder Man II#18) - News reports detailed the favorable response of the population, describing them as the saviors of a terrified city (Los Angeles). Armed Response continued to advertise its services, including testimonials from a number of people, even from the Los Angeles Police Department. The chief of police backed off on his threat to ban Armed Response pending investigation. A "carefully orchestrated citizen's group" petitioned the mayor to have Armed Response deputized. The city council planned to vote on a plan to consider Armed Response for special city security jobs. 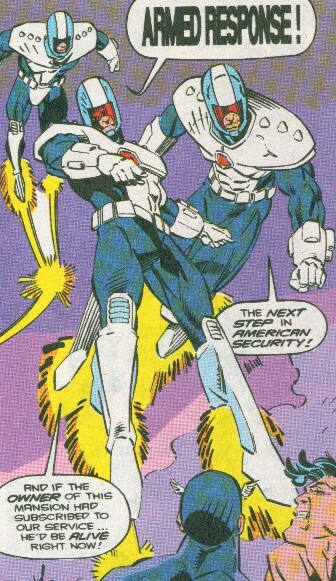 (Wonder Man II#19) - The Crazy Eight spied on Armed Response, learning that they were actually just a protection racket, information they caught on film. They were caught in the act by Armed Response, who sought to kill them and/or steal their camera, but the Eight narrowly managed to escape. They passed the tape on to Beverly Fairfax, a news anchorperson. (Wonder Man II#21) - When Wonder Man threatened to foil Splice and Rampage's efforts to terminate the Crazy Eight. Lotus instructed Andrew to send in Armed Response to assist Splice and Rampage. Wonder Man defeated Splice and Rampage, but as he tried to take an injured member of the Crazy Eight to the hospital he was surrounded by Armed Response. Wonder Man reminded them that they were under police investigation, but then he told them that if they failed to defeat him, he would kill every single one of them. Intimidated, the group backed down and let him pass..
Lotus responded to this defeat by instructing her assistant Andrew to take the blame for Armed Response and all related activities. (Avengers Two: Wonder Man & Beast#2) - Lotus deployed Armed Response against Wonder Man and the Beast. Despite their armor being upgraded, the two heroes defeated them and turned them over to the LAPD. COMMENTS: Created by Gerard Jones, Jeff Johnson, and Dan Panosian.